The Sea Venom was the navalised version of the Venom NF.2 two-seat night fighter, and was used as an all-weather interceptor by the Fleet Air Arm (FAA). The necessary modifications for use on the Royal Navy's aircraft carriers included folding wings, a tailhook (which retracted into a characteristic "lip" over the jetpipe) and strengthened, long-stroke undercarriage. The canopy was modified to allow ejection from underwater. The first prototype made its first flight in 1951, and began carrier trials that same year. A further two prototypes were built. The first production Sea Venom took the designation FAW.20 (Fighter, All-Weather). It was powered by a single de Havilland Ghost 103 turbojet engine and its armament was the same as the RAF version. The next variant was the FAW.21, which included the modifications introduced in the Venom NF.2A and NF.3. Some of these modifications included the Ghost 104 engine, a clear-view canopy and American radar. The final Royal Navy variant was the FAW.22 powered by the Ghost 105 engine. A total of 39 of this type were built in 1957–58. Some were later fitted out with the de Havilland Firestreak air-to-air missile. In 1956 Sea Venoms, alongside RAF Venoms, took part in the Suez War which began on 31 October. They were from Nos. 809, 891, 892, 893, 894, 895 Naval Air Squadrons based on the light fleet carrier HMS Albion and fleet carrier HMS Eagle. The Anglo-French invasion, codenamed Operation Musketeer, took place in response to the nationalisation of the Suez Canal by Egypt's leader, General Nasser. The air war began on 31 October 1956 signalling the beginning of the Suez War. The Sea Venoms launched many sorties, bombing a variety of targets in Egypt in the process. Sea Venoms also saw service during conflicts in the Middle East. By 1959, the Sea Venom began to be replaced in Royal Navy service by the de Havilland Sea Vixen, an aircraft that also had the distinctive twin-boom tail. The Sea Venom would be withdrawn from frontline service soon afterwards. The type continued to fly with second line FAA units until the last were withdrawn in 1970. 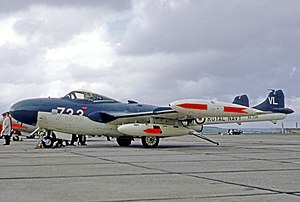 Thirty-nine Sea Venom FAW.53s saw service with the Royal Australian Navy (RAN), replacing the Hawker Sea Fury. The Sea Venom entered service in 1956 and, during its service with the RAN, operated off the aircraft carrier HMAS Melbourne. It was taken out of first-line service in 1967, replaced by the American McDonnell Douglas A-4G Skyhawk. The Aquilon saw service with the French Navy until being withdrawn in 1965. Prototype Sea Venom, based on Venom NF.2., three-built. Initial production aircraft, based on Venom NF.2A. 4,850 lbf (21.6 kN) Ghost 103 turbojet engine, AI Mk 10 (US SCR 720) radar. 50 built. Improved version, equivalent to Venom NF.3. 4,950 lbf (22.1 kN) Ghost 104 engine, AI Mk 21 (US APS-57) radar, strengthened long-stroke undercarriage. 167 built. Six FAW.21s modified from 1957 for ECM purposes. No armament. More powerful (5,300 lbf (23.6 kN)) Ghost 105 engine, giving improved high-altitude performance. 39 new built. Australian designation for the Sea Venom FAW.21. 39 built. Aquilon 20 – 4 examples assembled from the parts provided by de Havilland plus 25 locally built. Aquilon 201 – Single prototype built in France. Aquilon 202 – Two-seat version with ejector seats, an American AN/APQ-65 radar and air-conditioning. 50 built. Aquilon 203 – Single-seat version with an American AN/APQ-94 radar and equipped with racks for air-to-air missiles. Prototype converted from Aquilon 202 plus 40 built. Aquilon 204 – Two-seat training version without guns. 6 Converted from Aquilon 20. Aquilon 203 No.53 preserved at Rochefort-en-Terre, France. Sea Venom FAW.21 – XG613 on display at Polish Aviation Museum, Cracow, Poland (previously exhibited in Duxford). Sea Venom FAW.22 – WW145 on display at National Museum of Flight, East Fortune, United Kingdom. Sea Venom FAW.22 – XG680 on display at North East Aircraft Museum, Sunderland, United Kingdom. Sea Venom FAW.22 – XG691 is being restored at the Malta Aviation Museum in Malta. Sea Venom FAW.22 – XG737 is being restored at East Midlands Aeropark. In Australia, Sea Venoms are on static display at the Fleet Air Arm Museum at air station HMAS Albatross (FAW.53); at the South Australian Aviation Museum in Port Adelaide, South Australia; at the Australian National Aviation Museum at Moorabbin Airport in Melbourne; and at the Queensland Air Museum (QAM), Caloundra, Sunshine Coast, Queensland (WZ898). ^ Gunston 1981, p. 56. ^ a b Jackson 1987, p. 479. ^ Sturtivant 1990, pp. 81–82. ^ Sturtivant 1990, p. 86. ^ a b c Mason 1992, p. 363. ^ Sturtivant 1990, pp. 89–90. ^ Sturtivant 1990, p. 88. ^ Sturtivant 1990, p. 85. ^ Jackson 1978, pp. 481–482. Wikimedia Commons has media related to De Havilland DH.112 Sea Venom. Jackson, A. J. (1978). de Havilland Aircraft since 1909. London: Putnam. ISBN 0-370-30022-X. Sturtivant, Ray. De Havilland's Sea Venom...a Naval Twin Boomer. Air International, Vol 39. No 2, August 1990, pp. 81–90. ISSN 0306-5634. Thetford, Owen. British Naval Aircraft 1912–58. London: Putnam Publishing, 1958.